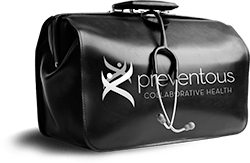 The members of your Preventous health care team are a specially selected group who share some common, and very important, values. We are passionate about preventing illness so you can live a healthier, happier, more productive life. We look at how your whole body is functioning and how your mind, body and spirit are working together. Your health care plan will be custom-tailored to your needs, abilities and goals. Wherever possible, we work within the health care system so you’ll only pay for treatments not covered by Alberta Health Care and other insurers. You can trust that we will always say what we mean and do what we say we will do. We want to get to know you well. You’ll never feel rushed and you’re always welcome to ask questions. A team of medical professionals, fitness and nutrition experts works with you to help you improve your health. You can count on us to address your health concerns as they arise. Call or email us anytime and visit our website for health information and updates. We’re committed to providing the highest level of care and to upgrading our skills and knowledge through lifelong learning. We respect your right to privacy and confidentiality. Your information is protected by strict adherence to the guidelines set by the Health Information Act. We use workshops and seminars to take our passion for wellness to the community we serve. When you walk in the door of our Centre, you’ll find an atmosphere of passion, trust, openness and honesty, empowerment, accountability, teamwork and respect. Our promise is to provide you with the very best health care available in Calgary.